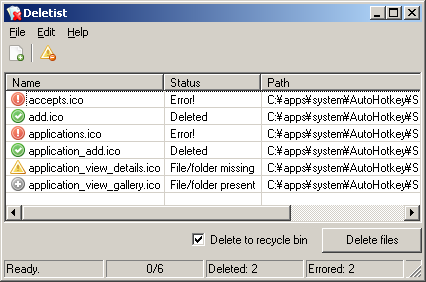 Topic: Do you know an app that deletes files/folder on a list? Re: Do you know an app that deletes files/folder on a list? Topic: Is there a program which can revert the mouse pointer direction? Re: Is there a program which can revert the mouse pointer direction? Is this acceptable only from moderators or can all of us use profanities? That's great use of language, billon: you should go far and, the farther away, the better. Topic: Why has the topic, "How Do I combine Rar files? ", disappeared. I got a notification that there was a reply at Fri Jan 25, 2019 9:56 am in the topic, "How Do I combine Rar files? ", but clicking the notification link just results with the statement: "The requested topic does not exist." I'm curious about why it was deleted. Topic: http[colon]//boonwirsdownjohn[dot]ga is a copy of TPFC: WTF? What the hell is this site, http[colon]//boonwirsdownjohn[dot]ga, about? It's some sort of really poor copy of TPFC. Does it breach copyright? What purpose does it serve? What does "boonwirsdownjohn" mean or stand for?